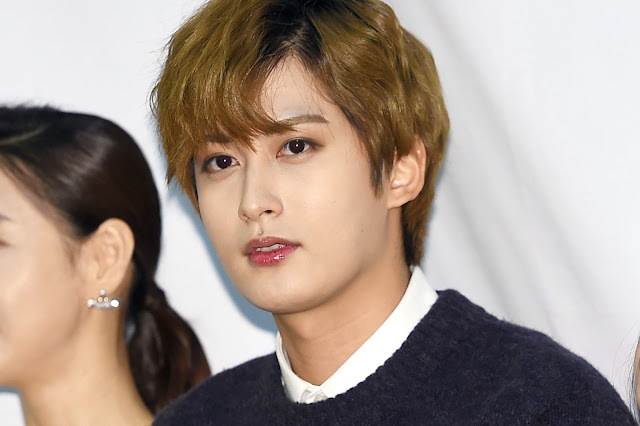 On October 7, a press conference for Block B Jaehyo's web drama 'What's happening' was held in Seoul. It is notable that the 5th-year idol appears in a drama for the first time since his debut, while he will play a thoughtful young man in the drama. By the way, Jaehyo filmed a kiss scene for the drama, and his partner was actress Go Eun Mi, who is 15 years(!!) older than him. Well, the drama is about a romance between a young man(Jaehyo) and 40-year-old lady(Go Eun Mi). And in the drama, the lady suddenly becomes a 10-year-old girl, and Jaehyo's character, Joo Ilwoo, becomes confused. Jaehyo looked uncomfortable at the press conference because of his leg injury, but he said it's OK. The web drama is aired on Daum TV and Kakao TV from October 8. As it is my first ever drama, I was very nervous before filming the drama. I was nervous even before the script reading. I read the script many times and did my best. It was hard to fall in love with 40-year-old lady and 10-year-old girl at the same time in the drama. When I acted with Go Eun Mi, I felt comfortable, and I felt energized when I acted with child actress Cho Eung Hyung. Both of them helped me a lot and I could do better. I think I've learned a lot from the drama. When I received a casting offer, I heard that my partner is Block B's Jaehyo. I searched his profile and I got to know that he is 15 years younger than me. I was so excited before filming the drama. (laugh) A kiss scene with Jaehyo was absolutely different from love scenes with male actors who are about my age. It was fresh. I felt like I was back in my 20s. As he was so shy, I led the kiss scene.